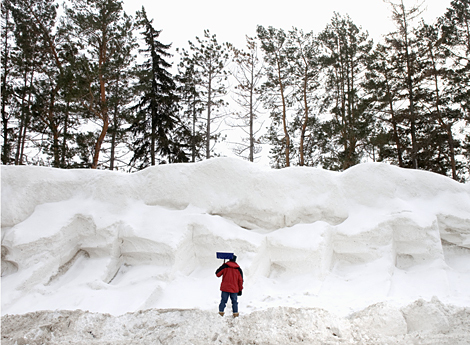 No one really wants to take on snow shoveling in the winter time, especially this man with a giant pile of snow like this one in front of him. Obviously he is not going to tackle this particular snow pile. But thousands of us do every year. We tackle snow drifts and snow that is pileed at the end of our driveways by the snow plow. And yes, thousands of us probably should not tackle something like this. Because many people die of heart attacks every year from shoveling snow. At least purchase a snow blower to clear the snow if you do not want to hire a snow clearing company. At least with a snow blower you can clear snow quickly. If you allow it to do all of the work for you, then it is not a very difficult thing to do. Most important it is not too taxing on the body. Snow shoveling can provide an excellent workout, but like any exercise, people must tackle things in moderation. If you are the typical couch potato and take on large snow drift you are just asking for trouble. Take your time, stop every once and awhile if you are breathing hard. Catch your breath and avoid over exerting yourself. If you feel any tightness in the chest or any chest pain, stop at once and call the doctor or get to a clinic. If it is severe you probably want to call an ambulance right away, because you are likely having a heart attack. Snow shoveling is one of the most strenuous types of exercise and anyone who does not exercise on a regular basis should really ease into it. If it takes two hours to clear the driveway instead of one because you are taking your time that is a heck of a lot better than having a heart attack. One friend of ours who does not exercise at all and gets out of breath going up the stairs shovels his driveway all of the time. He will do four or five shovelful and then stop for a rest. He is breathing hard and at least he is smart enough to know that he cannot overdue it or he is going to have problems in the heart area. So far he does not have any chest pain and it appears he is simply very much out of shape. His family and his friends have tried to talk him into either exercising or hiring a snow removal company. He is stubborn and will not do either. We think it is just a matter of time when we find him at the end of his driveway slumped over. If you have any pain at all, then get it checked out. It is just not worth it to be so difficult and hard on yourself. This site is supposed to be about snow blowers. But we would remiss if we did not cover snow shoveling and snow clearing companies. If we stop one person from having a heart attack by writing this post then we have done a good thing. Don’t be so cheap, buy a snow blower or hire someone to clear the snow for you! In fact they are not even that expensive to buy or to hire someone. Next to shoveling snow, buying a snow blower is the most economic compared to hiring a company to clear the snow for you. But then you do not have to out in the cold weather either when someone does the job for you. You may still have to clear the step. Also light snow falling on your driveway. However this obviously much better than shoveling heavy wet snow that is very taxing on the body. The subject of your health and snow clearing is a really important subject. Every year many men have a heart attack while they are shoveling snow and even die because they thought they could shovel show without any repercussions. 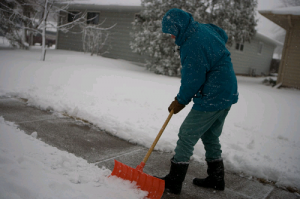 Unless you are very fit and exercise on a regular basis, you may want to take it easy when it comes to shoveling snow. Imagine that you are one of these couch potatoes or perhaps you walk a bit, but you do not exercise on a regular basis which pushes your heart rate and muscles to a level that increases your overall health. Now suddenly you have a foot of snow on the driveway. You do not have a snow blower and you have not hired anyone to clear the snow for you. Out you go to clear the snow with shovel in hand. The snow is deep and heavy due to the warm temperatures. Even after 5 minutes you are puffing and sweating. Instead of stopping and catching a breather allowing your body to catch up to your exertions, you keep going only making it worse. Prime heart attack time! No warm up and you are not monitoring your heart rate. You begin to feel pressure in your chest and arm! Clear signs that your heart is under stress and may be getting ready for a heart attack! This is what happens to many people who are not in shape an in fact are grossly out of shape. next thing they know they are sprawled on the driveway clutching their chest and hoping someone will see them to get help! Do not let this happen to you! In a previous post we compared the economics of purchasing a snow blower vs. hiring someone to clear the snow for you. These are two definite alternatives that are much better than shoveling and in the case of hiring someone you do not need to do any work at all. If you are at all concerned about your health, make a decision today regarding how you will clear you driveway of snow in the winter time. Now is actually the time to hire a snow removal company for next winter. They are starting to take contracts and will be happy to sign people up early. Also if you have one in mind that you does good work you will want to get a contract with them nailed down before everyone else does. Using a snow blower is either really easy for people or difficult. Sounds silly to write that, but it is true. If you are the type that feels they have to man handle the blower, then you are going to work hard. Let the machine do the work for you. Use it’s power to change direction, to go back and forth and to blow the snow. If you are doing it right you should be able to navigate with the snow blower with one hand. Let it do all of the work placing little strain on your body. Why even take the chance of having a heart attack of straining your back? If you suspect that you might be susceptible, then just spend the money to hire a snow clearing company. After all if you are not around, it really will not matter how much it cost. Feel free to leave us comments on this post. Note that spam comments will be deleted. We would love to hear what you have to say about this subject or any other posts on this web site. For more details about snow shoveling, click here.